Ahem...This is more for the ladies! We know the ladies have all sorts of accessories and jewelry to wear. And why not, who doesn't like to look pretty, right? Even the men would want to look good from time to time, although quite a number of us couldn't care less about that. 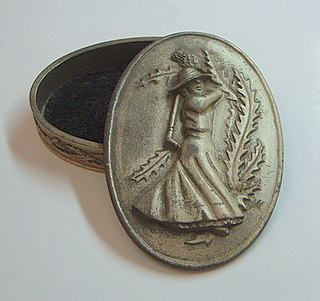 Anyway, for the ladies, a pewter trinket box is a nice item to have for keeping your rings, bracelets and ear rings. A beautifully crafted trinket box could even be as precious as your jewelry, instead of just another storage item. For the men, it will be a nice gesture to include a trinket box to match the ring or necklace you're buying for the ladies. I have a pewter trinket box in my collection (see picture above). This is an American piece and is pretty old, as you can easily see from the surface. I'm not sure exactly how old it is though, but from the design and traditional artwork I think it's probably seen a number of decades flying by. Much like the golf ball the lady on the cover just hit, I guess. There is a mark underneath the cover with the words 'Port, USA' encircling a shield. It's not very detailed and is too small for my camera to snap. I had to look under a magnifying glass to make out the words. I've yet to find a reference to any pewterer or mark as described. Here's another look with the cover open. Would you have any idea how old this trinket box is? If you do, then you're welcome to contact me. I'd certainly like to get more information about this piece. You'll be credited as the info source, of course. 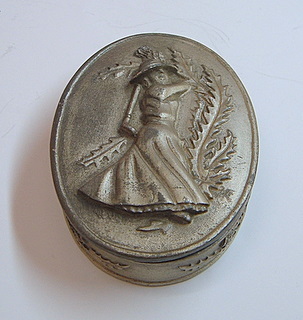 There's another pewter trinket box in my collection and I think this one would appeal to most ladies. 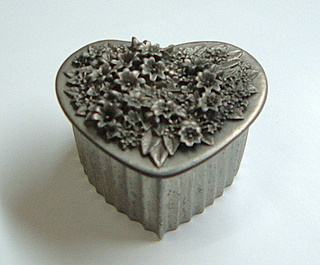 It is a heart-shaped box and the cover is intricately adorned with many, many flowers. I tried counting the flowers but gave up after thirty. There were just too many small flowers all around the big ones you see easily in the picture. The cover on this box is surely one of the most nicely designed among all the items in my collection. In fact it is so finely made that there were too many hard-to-reach places when I tried to give it a good cleaning after snapping it up from the seller. I know it's definitely a nice piece because even my other half liked it! You can also check out other pewter accessories on this website.